"Literally meaning pepper water. 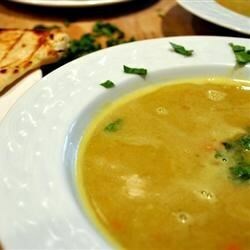 Mulligatawny Soup is an Anglo-Indian invention. Created by servants for the English Raj who demanded a soup course from a cuisine that had never produced one. You can make this soup a day ahead and you can add chicken pieces in the soup as well." Heat ghee or vegetable oil in large pan (use low heat); cook onion, garlic, ginger, chilies, spices and curry leaves, stirring, until onion is browned lightly and mixture is fragrant. Do not over brown the onion or else it will give the soup a burnt taste. Add carrot, apple, potato, dhal, and chicken stock to pan; simmer, covered, for about 15 minutes or until vegetables are just tender. Discard cardamom pods and curry leaves. Blend or process soup mixture, in batches, until pureed; return to pan. Add tamarind, lemon juice, coconut milk and fresh coriander leaves; stir until heated through. definitly do not puree, takes away all the flavor. Mmm...this is tasty and authentic. The key to good Mulligatawny Soup is an aftertaste that lasts for hours. This has it!! !